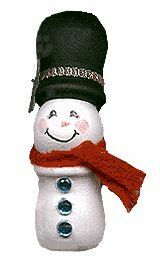 Use a couple of wooden candlecups and a wooden ball to create this little snowman Christmas decoration. Pencil Crayons or Paint: Black, Red and Orange. Glue wood ball to opening of one candle cup and set aside to dry. Paint the other candle cup black and paint joined candle cup and ball with white paint. Allow to dry. Glue rhinestones or buttons to the center front of the white candle cup. Glue black candle cup to the top of the white ball to create the snowman’s hat. Glue a small gold ribbon around the hat, then tie a piece of scrap fabric around the neck to create the scarf. Draw the face with paint or pencil crayons [I used pencil crayons]. Check out the sample face patterns on this page for help in drawing the facial features.